Well, it's that time of year again! Summer is drawing to a close. Kids are going back to school, the days are getting shorter and the air is getting just ever-so-slightly cooler. Soon it'll be pumpkin spice everything, crunchy leaves and decking yourself in scarves. Until then, we're can desperately try to squeeze the last few drops out of summer. What better way to keep summer alive for just a little longer than one last summer vacation? These short, end-of-season trips are meant to be relaxing, simple getaways, but they often turn into more hassle than they're worth. 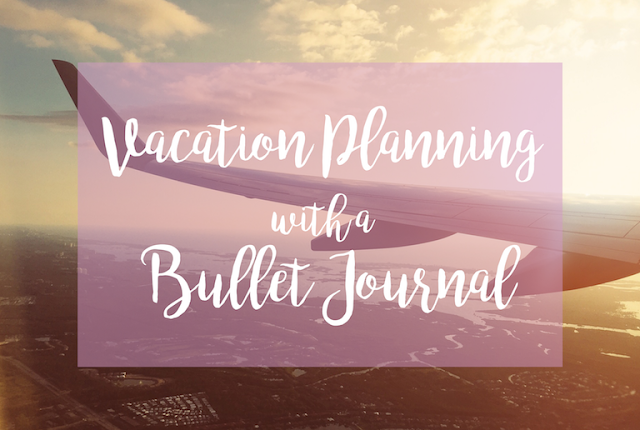 However, when you're vacation planning with a Bullet Journal everything seems so much easier to organize and it's actually possible to enjoy the final hurrah of the summer! For our last vacation of the summer, four of us decided to head to Denver, Colorado over Labor Day weekend for some good food, gorgeous hiking and seeing some beautiful art. Now, as you could probably guess, I'm a pretty big planner. However, that's nothing compared to when my sister and I combine forces. She's a fellow Bullet Journalist and an even bigger type-A personality than I am. Since we were both going on this trip, we worked on planning it together. This meant that the whole thing -- flights, Airbnb, car rental, activities and restaurants -- was planned in a matter of hours! I find that the best way to organize something out of the ordinary is to try to incorporate it into your normal routine as much as possible. That way things don't seem so stressful and planning doesn't seem so unapproachable. Because this trip was just a weekend trip, I already had the days in question in my weekly layout. 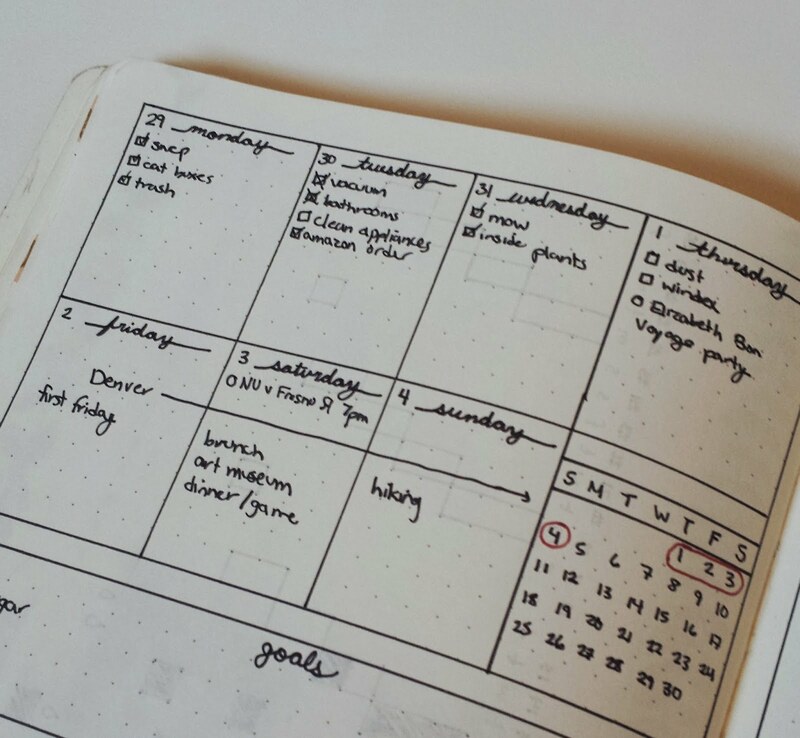 Planning out our activities was as simple as filling in my weekly layout -- something I already do anyway! All my vacation plans, right alongside my regular week tasks. Even planning out restaurants was a snap. 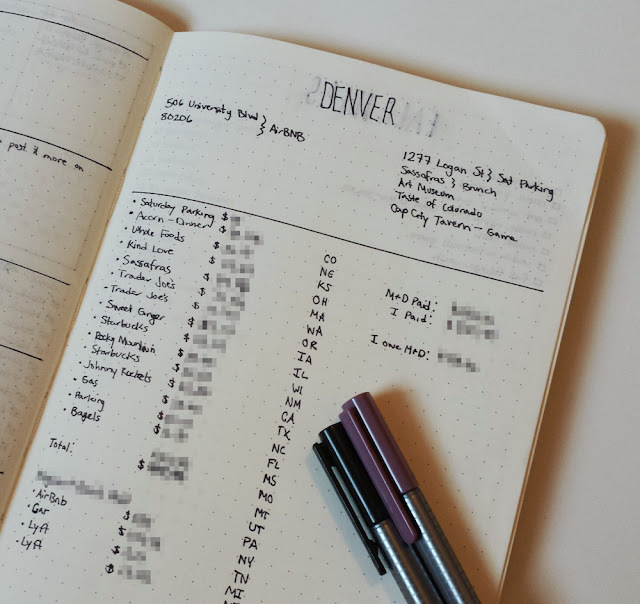 I already include a meal planning section in my weekly layout so dinner at Acorn, brunch at Sassafras, and a quick stroll around A Taste Of Colorado were all planned just as if I were planning a regular old weekend of meals. Same goes for workouts! I'm obviously not going to be hitting the gym when I'm supposed to be relaxing, but when you're heading to mountains as picturesque as the Rockies, you have to do at least some hiking. A few trail names jotted down in Sunday's workout slot and I was good to go! One of my biggest struggles when I go on vacation is trying not to take my entire closet with me. I always over-pack. Somehow I manage to convince myself that I'll be caught in a freak accident leaving me with drenched, muddy and completely ruined outfits. The fact that this has literally never, ever happened to me before and likely never will doesn't seem to matter to my brain at all. So my attempt at drawing tiny mountains wasn't the best... At least my packing list was thorough! In order to control the urge to pack everything I own, I created a packing list in my weekly spread. 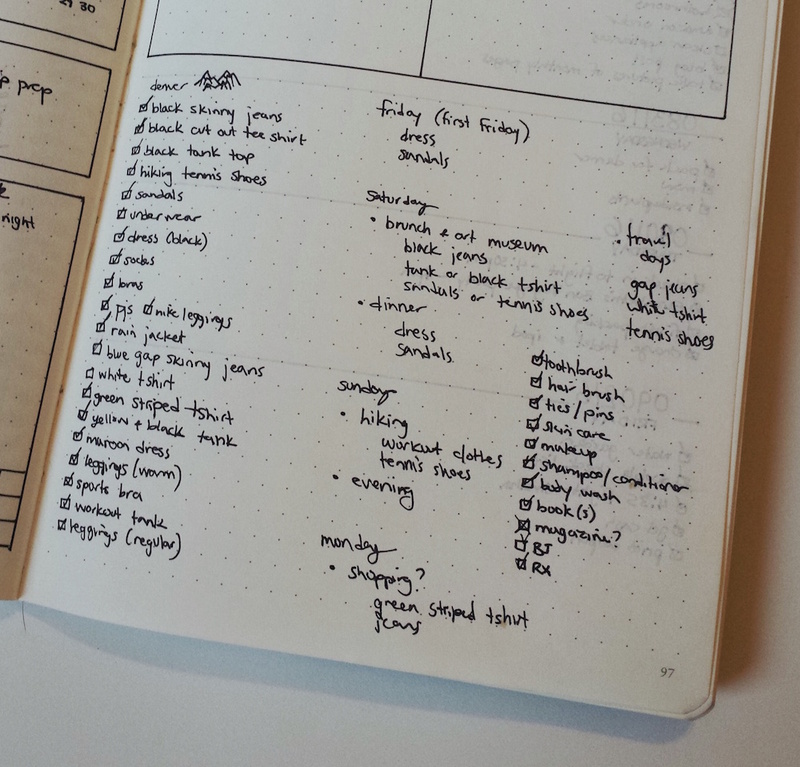 We had already planned out what activities we'd be doing each day, so it was super simple to plan out my outfits. In turn, knowing what I was going to wear made coming up with my full packing list a breeze. Seeing everything I was bringing all written out really helped me visualize how much I already had and prevented me from convincing myself to bring anything extra. Once we hopped on the plane to Denver, my Bullet Journal was more invaluable than ever. I wrote down flight confirmation numbers and the address of our Airbnb so I wouldn't have to worry about my phone dying. During our trip, I wrote grocery lists and potential places to watch the Husker game on Saturday. (We're from Nebraska. Football fandom doesn't stop for vacation!) Most importantly, I used my Bullet Journal to track all our expenses. Addresses, expenses, even a list of license plates we saw! What do you do to help organize, plan and track your vacations?